Calendar with advanced graphics and ToDo feature. Is there a better alternative to Airborne Mini Calendar? Is Airborne Mini Calendar really the best app in Desktop category? Will Airborne Mini Calendar work good on macOS 10.13.4? Airborne Mini Calendar needs a review. Be the first to review this app and get the discussion started! Airborne Mini Calendar needs a rating. Be the first to rate this app and get the discussion started! 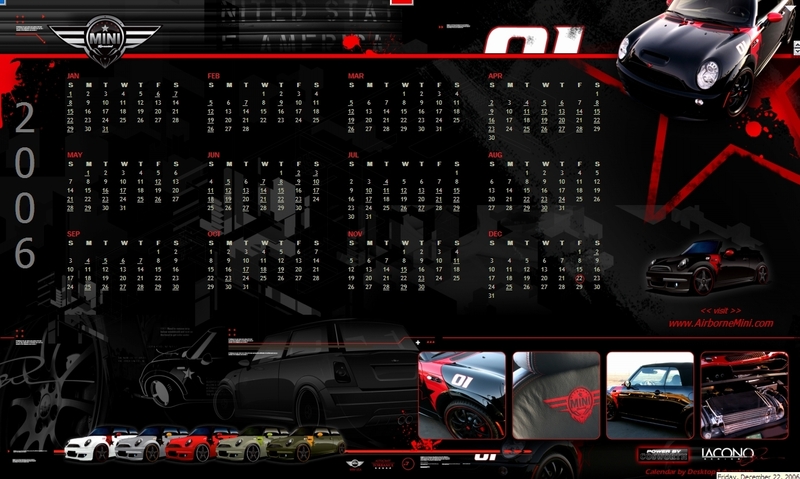 Airborne Mini Calendar is a full featured Desktop ADvantage calendar based on the Airborne Mini design of west coast car designer, Joe Iacono. The calendar features stunningly produced graphics, a super convenient 3-year calendar view, an easy to use weekly planner and a running "To Do" list. Never more than a click away - - the calendar is accessed by clicking the patented tab always available at the top just below the Mac menu bar. One click scrolls the calendar down filling out the entire screen (click the tab again to scroll it back). The calendar's graphics feature clickable hyperlinks to facilitate visits to the Airborne Mini website. The calendar is free and nicely appointed but, by design does not overwhelm the user with features upon features. Even if you use iCal or some other calendar program, this calendar is worth having just for its one-click annual view and advanced graphics. Contact us about producing a custom calendar for your company. We also have pre-produced themes that can be branded with your company name and web-links. It's a great marketing tool and affinity branding at its best. The Desktop ADvantage calendar is an nFinity product, from the makers of QuickVoice.